This is the final post about the great Jack Nicklaus golf courses in Thailand and covers the other, non-Mission Hills, courses. Legacy Golf Club (formerly Winsan and before that Natural Park Ramindra Golf Club) at over 7,000 yards is a tough course, heavily bunkered around most greens and with huge water hazards. The conditions are well kept and the golf course being located only around 30 minutes from town is a good choice for those in Bangkok wanting to play a top course and not travel too far. 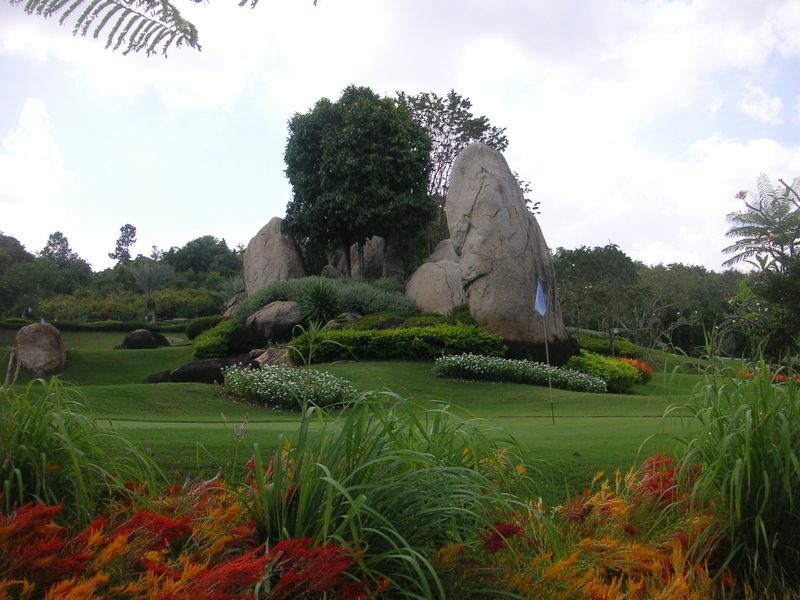 Laem Chabang International Country Club is the best course in Pattaya, and one of the best five in all Thailand. It is a world championship golf course made up of 27 holes on 700 acres and features three types of terrain which characterize each of the nine holes. The Lakes and Valley courses meander along pristine natural waterways while the Mountain nine provides commanding views of the surrounding area and is the most challenging of the three nines. This top course is a must play for anyone in the Pattaya area and I include Laem Chabang in all Pattaya golf packages. Here is a secret tip when planning which day of the week to play at which Pattaya golf course. Of all Pataya golf courses, the green fees at Laem Cbang on the weekend and weekday are the most similar. Other area golf courses can charge more than a 50% premium to play on weekends. This makes Laem Chabang a good choice for Saturday or Sunday golf, while sticking to the other course for weekday play and saving costs in the long run! Springfield Golf Resort for a long time has been rated as the best golf course in Hua Hin and although it was designed as a championship golf course, it remains an enjoyable challenge for golfers of all standards. Each hole has five tees to play from. Water hazards regularly come into play and each hole presents its own individual challenge and character. Accuracy is required at all times as the fairways are flanked by a series of hillocks and covered by a forest of small trees. Nicklaus designs love to catch the player out who hits a poor weak fade, better known as a slice and the back nine when tiredness begins to creep into your game can be punishing with either a huge waste bunker and water, or just water, on your right hand side and close to the fairway. Lately, the maintenance and conditions at Springfield have gone down hill and allot of work is to be done over the next few months if the golf course is to be in shape for the coming high season. There is a new greens keeper on board, and he has his work cut out for him. Kirimaya Golf Club is another challenging Nicklaus course set amid delightful scenery in the Khao Yai National Park. It is the only 5-star Khao Yai golf resort and in and of itself is a great play, albeit a bit high priced especially considering the 750 baht mandatory golf cart fees. However, honesty speaking, other than for a long weekend for local expatriates, there are better Thailand golf destinations with more golf course variety and better tourism infrastructure. This finishes the 3 part postings on Jack Nicklaus’ Thailand golf courses. The next post will move on to another famous golf course architect. Any suggestions? Feel free to e-mail me at my Thailand golf vacation company.